A new auto financing study from credit bureau Experian revealed some interesting credit score trends among drivers. The company found that those who financed their Volvos in the third quarter of 2012 had the highest credit scores of all new car buyers. The average score for drivers of the Swedish automaker was a very respectable 818, which is certainly an excellent credit score by any measure. 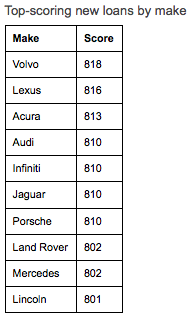 Not far behind were Lexus owners and Acura drivers, who had average scores of 816 and 813, respectively. Both makes are considered luxury brands, though in a more conservative sense. On the opposite end of the spectrum were Mitsubishi buyers, who had an average credit score of just 694. 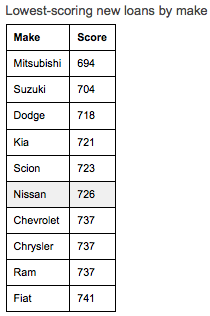 They were worse than Suzuki buyers by 10 points and much worse than Dodge drivers, who averaged 718 credit scores. As you can see, some of the cheaper brands seem to be on the bad list. Additionally, one could argue that many of these brands are geared toward younger drivers. Conversely, the good credit score list tends to have car makes aimed at older drivers. And in case you didn’t already know, time is a key component of credit scoring, as history of on-time payments and accounts that have been open for years tends to lead to quality credit scores. All in all, credit scores seem to be on the decline. The average consumer credit score for loans on new cars fell eight points from 763 to 755, when comparing Q3 2011 numbers. 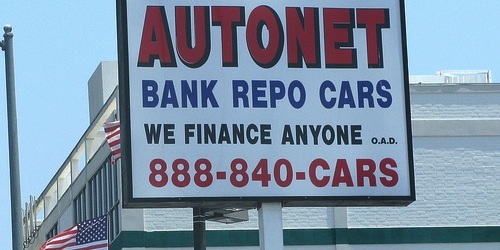 For used cars, the average credit score fell from 676 in the third quarter of 2011 to 668 a year later. However, 30-day and 60-day auto delinquencies have both fallen, as have car repossessions. And the average credit score for new auto loans has increased from the subprime heyday, rising from 749 in the third quarter of 2007 to 755 five years later. So auto financing companies are a little more risk-averse despite a drop in delinquencies. From what I can see, it appears as if drivers of safe and luxurious brands tend to have the best credit scores. This may be a direct reflection of how they manage their own credit and personal finances. Conversely, those with lower credit scores are relegated to less opulent brands, either because they’re young or because their credit isn’t as good as it could be. Keep in mind that if you do want to finance a luxury automobile, a solid credit score is a must. Even if you do qualify for a loan with an average credit score, you won’t obtain the lower interest rate available, and thus will pay more for falling short. This is yet another reason to stay on top of your credit score, as it can and will cost you in the form of a higher monthly payment. Heck, it can even raise your car insurance costs! Read more: What credit score do I need to buy a car?